While there are a ton of hands-on, creativity-inspiring messy toys on the market, sometimes, it's good to just work with what you have. I have three daughters who are each three years apart in age. So, you can imagine that when they were all under 5 years old, or even when they were all under 10 years old, my husband and I were tired -- a lot! But, although you may be tempted to let your kids sit in front of the TV (when my kids were little) or any screen (as happens to be the case today) just so you can catch a break, as a good parent, you know that screen time has to be monitored. Crafts and activity toys are such an engaging way to keep kids occupied -- especially the ones that offer the easy cleanup. Lets face it: We need to keep them busy, let them create a masterpiece as good as any Van Gogh (in your eyes, at least) and clean up in a shake. But the finished product and clean up is not where the best memories lie. I had to dig a little to find these images, but what a day we had, and more than a decade later, I remember it like it was yesterday. It was a snow day and my two youngest girls had their best friends over. I love to bake, and while I don't do it often -- because when I do, it's the real deal (butter, sugar, lots of chocolate) -- my best memories are all in my kitchen, and they all involve big messes. This particular snow day was all about sugar cookies. We made the dough, put it in the refrigerator for the right amount of time and then began rolling it out on my granite countertop, where we used lots of flour on the counter and rollers so the dough wouldn't stick. My middle daughter, Brittany, used to love to chant "I'm a dirty kid and I don't care," and she didn't! They all looked like this but mostly, my Brit was covered head to toe in flour. Was this the most memorable part of the day? Almost, but not completely. For a mom who loves to bake, I should have known better. When the cookies were baked, decorated and cooled (and the batter was licked and the cookies were eaten), the next stop was the bathtub. 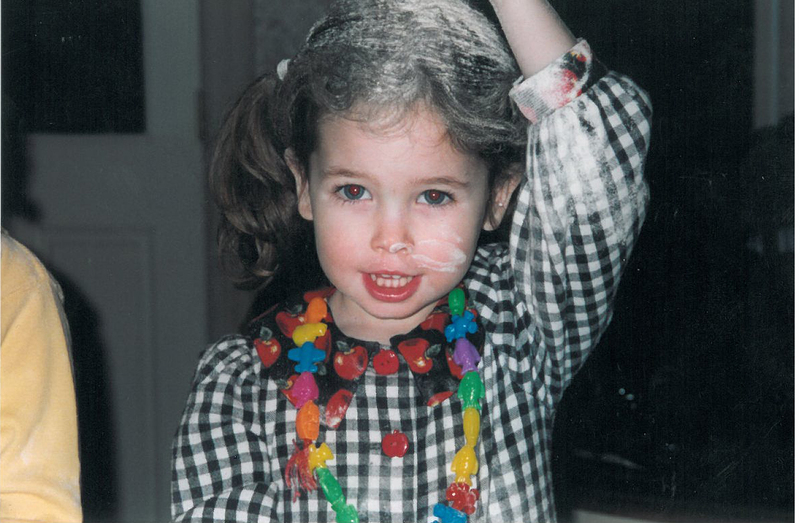 I -- thoughtlessly -- added water to the tons of flour that settled in my daughters' hair, which left me with a thick, gooey mess, instead of clean and happy kids. Feel free to laugh now! While there are a ton of hands-on, creativity-inspiring messy toys on the market, sometimes, it's good to just work with what you have. If you don't bake, then go to your nearest nursery and get seeds for plants and let your kids get some dirt under their fingernails while learning how to begin a garden. Or, if it's raining (with no lightning), take your kids outside in their yellow ponchos and dance in the rain. I can fill many albums with images just like these, all things that my family still laughs at and in a New York heartbeat, will do again at any given time. Sometimes, the mess is worth it. So, what are you waiting for? Go get dirty!